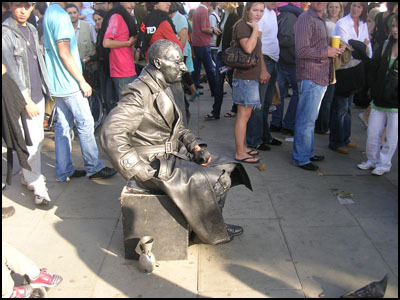 Have you ever met a human statue? If not go by the London Eye and you will spot some. They are quite skilled artists and are able to stay motionless for hours. Some of them are so good - like the one in the picture - that pigeons have rest on their head! But that’s ok for the living statue as people put more money in the pot when their feathered friends are using them as a tree! J’aime votre blog. Je peux vois London sans partir de chez moi. Comment vous trouvez le London Eye? Est-ce que c’est bon?